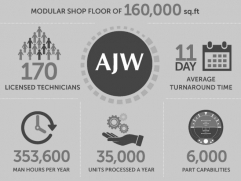 Major North American operators and trading organisations are continuing to select AJW Technique as their partner of choice for MRO, but why? Unit specific, industry leading and guaranteed shop turn-around times to enable inventory optimisation and greater stock turns that drive profitability. In just over five years, our 160,000 sq. ft. facility based in Montreal, has grown into a business which supports over 300 airline customers across 100 countries. We process around 35,000 units a year across over 6,000 part numbers, from both commercial and business aircraft, and hold 7 global approvals, all whilst offering an impressive 11 day average turn-around time. Contact AJW Technique to find out how we can improve your component relaibility.